This is a cute little spider craft. The spider bodies require cutting out circles, and the legs require cutting rectangles. You also have to fold the legs on the marked lines, which is a great activity for visual perception and motor planning. 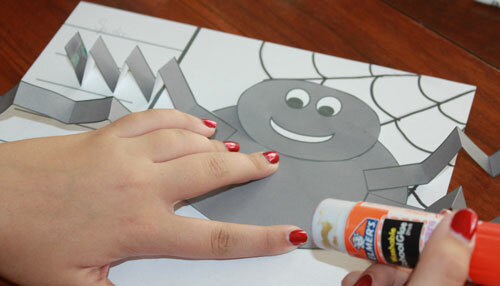 There is a light web on the base paper to have the kids trace over it and make their own spider web. It would be great to follow the web lines in glue and place yarn down too. Then you put your spider together, and write about spiders on the lines on the base paper.